Lots of people are worried about the bees. I know that local honey is really popular because I’ve seen when Dean McFadden shows up at the Farmers Market. His supply of local honey is gone in a heartbeat. Well, it seems that bees are having a little trouble. The life of a bee is fairly simple. A honeybee looks down, banks hard in flight, and lands in a colorful weave of zinnias, salvia, and cosmos in a sidewalk planter. She enters the flower blossom for a sip of nectar and exits dusted like a sugar donut. She’ll leave a smidge of pollen in each flower she meets; then she’ll go. This pollination is vital to our plants. Yet bees face many threats such as parasites, pesticides and sickness. Other threats include concrete cities, manicured lawns, and acres of one – crop fields that leave little food for the pollinators. There is a simple solution … plant flowers. Bees appear in spring, when temperatures remain above 50 degrees, and a small garden can fortify a colony. Even a single potted pansy serves up a buzz of energy. What we need are hundreds of backyard gardens and flower pots strung across the nation like a chain of food courts, feeding every pollinator for miles around. Check out Helm’s Nursery for the most beautiful pots and flowers around. Let’s feed a bee. Take our pollination seriously. Make a difference. Who ever thought you could feed a colony all by yourself? Go forth and fortify. Jody Ran a Good Race. Come by and see the new memorial bricks. It makes for some pretty good reading! 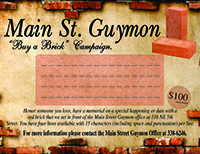 And if you have a person or a date or a place that you would like to have remembered, come by and visit about having a brick done. The cost is $100 per brick. It’s a cool gift. It’s going to be a great week on the bricks! Wishing you always … Walls for the wind, a roof for the rain, and tea beside the fire. Laughter to cheer you, those you love near you, and all that your heart may desire.